1. Design features of heavy type stainless steel 2 piece ball valve, 1000 wog. 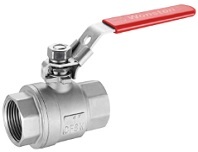 Stainless steel 2 piece ball valve, heavy type, 1000 wog, floating type. Design features: floating type, reduced port, blow-out proof stem, pressure venting hole in ball slot, BSP/ BSPT/ NPT threads, heavy type with locking device, 1000 WOG, two piece split body. 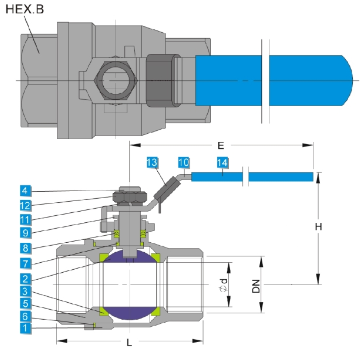 Technical drawing of heavy type stainless steel 2 piece ball valve, 1000 wog, floating type.